Irisys launches high-resolution, high-spec visual/thermal imaging camera. The feature-rich, user-friendly IR32DS offers a detailed 320 x 240 pixel resolution, bringing highly accurate dual imaging technology to thermographers and engineers. 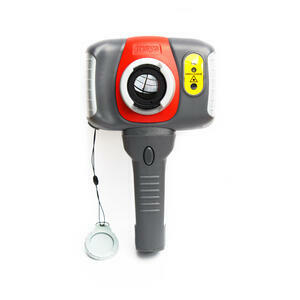 LONDON 26 October 2011: Irisys has launched its first high-resolution handheld thermal imaging camera, the IR32DS. The feature-rich camera’s 320 x 240 pixel resolution is normally found on far more expensive models, and is ideal for the engineer or thermographer who demands a crisp, detailed image and greater thermal measurement accuracy. With a 76,800 pixel display, the IR32DS offers four times the resolution of a standard 19,200 pixel array, providing excellent imaging performance especially for viewing smaller items and objects from a long distance. Typical applications include inspection of electricity power lines, distribution sub-stations, industrial plant and ceiling mounted industrial plant. Where small or complex items are to be viewed, the high 320x240 resolution allows detailed thermal images to be created for accurate thermal interpretation. The handheld, lightweight IR32DS enables engineers to capture and display thermal images, visual images, a fusion of the two, or as picture-in-picture. This makes it much easier to identify hot and cold spots, vital when making electrical inspections, energy efficiency surveys and for mechanical testing. Four moveable temperature measurement cursors allow easy comparison of components and items in the scene. In a 3-phase electrical supply, for example, an engineer can compare the temperature of each cable at the same time on the camera screen, rather than having to wait until the information is downloaded onto a computer. A time sequencing function allows unattended monitoring of equipment to observe changes in equipment performance. These can be at regular intervals, or as an alarm when a temperature falls outside pre-set parameters. Alarms are audible through the camera speaker or headphones; and visual, via the camera display. At five hours, battery life is also long, meaning a single battery can power an entire shift. The battery can also easily be replaced in the field. Over 1000 images can be stored on the supplied micro SD card. Voice notes can be added for each image for later play-back using the camera’s speaker or through a PC, saving time and effort compared with manual note taking. “The IR32DS will appeal to mechanical and electrical maintenance engineers who recognise how easy-to-use and highly accurate thermal imaging technology can help measure, monitor and identify problem areas that have previously been hard to find” said Andrew Rimmer, Divisional Director at Irisys.